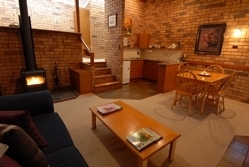 Blickinstal Bed & Breakfast offers a tranquil accommodation retreat high on the Tanunda hills, with stunning views across the Barossa Valley. 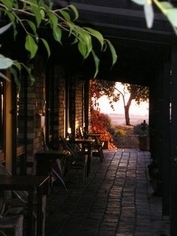 Set among vineyards and lush gardens, it's an excellent base to explore the Barossa wine region. 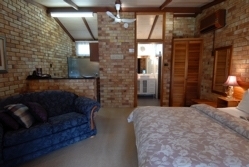 This fully hosted 4 star bed and breakfast accommodation, has 2 beautifully appointed split-level lodge apartments with spas and 4 studio units. Guests can relax in the peaceful location and enjoy the personalised attention. 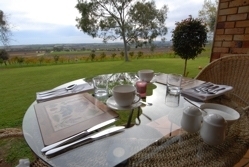 Be delighted with the hearty country breakfast served on our verandah overlooking the Barossa Valley below or in our comfortable Dining room located in the Homestead. Enjoy a local wine while you partake of the dinner or gourmet BBQ(by prior arrangement). Located only a five minute drive from Tanunda, Blickinstal is within walking distance of several top class wineries for which the Barossa is renown. All points of interest in this famous region are easily accessed by car.